Disclaimer: I hesitate to share this secret with you because the best thing you can do for your WordPress website is to purchase hosting on the high quality managed WordPress host. But I also realize that not every website requires the power of a managed WordPress host. My personal feeling is that whether you require it or not you should invest the money into a great web host. This website is hosted on Flywheel. For just $15/mo. you can get the same speed of this website. And if you host your website on Flywheel, caching is automatically included at the server level so you don’t have to install or do anything. You website will just be fast. Stop reading this article because you don’t need to read any further. Now having said that I have a secret to share with you about getting your website to load in 1 to 2 seconds no matter who your web host is. Actually this is not much of a secret. If you search the internet for tips and tricks for making WordPress faster you will find this word in almost every article that you read. The word is caching. Think of your website as a tangram puzzle. There are many pieces that make up your website. There’s your logo, your header, the content of the page, images, styling code, etc. 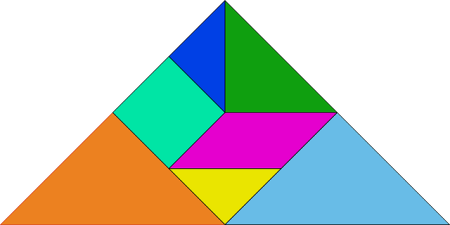 Each part of your website is a shape in the tangram puzzle. These pieces can be put together differently to form different shapes. WordPress is a dynamic website building software. That means WordPress takes information from a database and combines it with PHP, HTML, CSS code. Every time a user clicks on a webpage the WordPress software dynamically puts the puzzle together to form the webpage. This is why in general the more plugins you install and the more complex your website is, the slower it loads because WordPress has to put more pieces together to make up the webpage. That’s the basic and layman’s definition of a dynamic website. Static websites on the other hand do not use a database and are simple files that can be served quickly because they don’t need to be built every time a webpage is clicked. These are more like photographs rather than puzzles. Caching is a way to speed up your website by processing the website in advance. So when a user clicks on the link they get your website faster because much of it has been prebuilt and saved on the web server. Caching is also a very broad topic because caching can happen in several places and there are many types of caching. Caching can take place both on the Web server as well as on the visitors computer. One way WordPress can speed up loading a website on your visitors computer is by using a browser cache. And that means that once a person clicks on to your website many parts of the webpage will be saved in the user’s browser. These will be things like your logo image and many of the other image and code files that are on every page of your website. To keep our tangram illustration going, the first time a person clicks your website, they download all of the tangram pieces and several of those pieces are saved in the browser. Every subsequent page they click on will only have to load the additional tangram pieces so the webpage loads faster. Enabling the browser cache makes the webpages on your website load much faster if a person is clicking on more than one page or they come back to your website often. On your server you could have what is called a database cache. A WordPress database is filled with information about every post, every comment, and every aspect of the content of your website. Every time somebody clicks on a link on your website that database has to put together all the information for that page and then and then send that combined information to the word press code and then it’s displayed as a webpage. A database cache will save all of that combined information so that the server doesn’t have to pull everything together every time a link is click. If that collected information is already saved it can just use that chunk of information. You can also have a page cache. Entire webpages can be saved as a static file rather than being dynamically built every time someone clicks on a link. In our tangram illustration, entire tangram formations are prebuilt and a photo is taken of them so they can be recalled quickly. Because there is already a photo of the tangram formation, they don’t need to be built from scratch every time a user clicks on your website. I’ll mention one other type of cache that your server can use; this is memcache. Basically this is very similar to a page cash but instead of the pages of your website being prebuilt and then saved as a file, memcache takes it one step further and holds that page in your server’s RAM memory so that when someone clicks on a link they don’t even need to go to the hard drive of your server to get the page. That page is already in the memory of your server and it can be served ultrafast. I’m sure if your server administrator you’re cringing at my simplified and possibly simplistic explanations of caching. I apologize deeply to you and if you have any comments or corrections to the things that I’ve said in this post please leave them in the comments below. Now that you have a general understanding of caching, how do you add caching to your WordPress website? The answer is really simple, you add a plugin. I’ll give you my top three recommendations for caching plug-ins. Two of them are free and one is a premium plug-in. The premium plug-in is by far the best plug-in out of the three. The WP Rocket plugin is simple as it gets. Install the plugin, activate it and your website will instantly receive its speed boost. There are some settings and you can check every box and plugin will work even better. This plugin is my secret to amazingly fast WordPress websites even if you’re using a shared webhost. My second pick is the plugin that you should install if you’re not comfortable tinkering and trying all the settings. That pick is WP Super Cache. Very similar to WP Rocket in it’s ease of use, you can install the plugin, activate is, and turn on the easy cache option and your website will load much faster than before. My third pick is W3 Total Cache. This is probably the most powerful free caching plug-in available. But with great power comes great responsibility. To get this plug-in to work you will have to go through a lot of trial and error to try all of the settings. Because if you misconfigured this plugin, it will actually make your website slower. I wish I could give you the best settings to make this plugin work. But the truth is every web host is different and this plug-in works differently with each web host so what works on Siteground might not work with Dreamhost or another hosting company. So it will take trial and error to get this plugin to work. Get your website’s baseline speed using a speed test. Make a note of the load time and other details. Then turn on one feature of the plug-in, clear the cache, and test the speed again and see if it has improved the performance of your website. Continue to go through this process for every feature you want to test out in the plug. As you can tell this can take a long time and you’re results may vary based on the time of day and how busy your Web server is. Want a Super Fast Website? As you can tell, speeding up your website is simple, but does require a lot of work or the purchasing of a premium plugin. If you want a fast website, but don’t want to mess with these plugins, just give me a call or drop me a line. You can hire me to setup one of these plugins and your site will be blazing fast in no time.